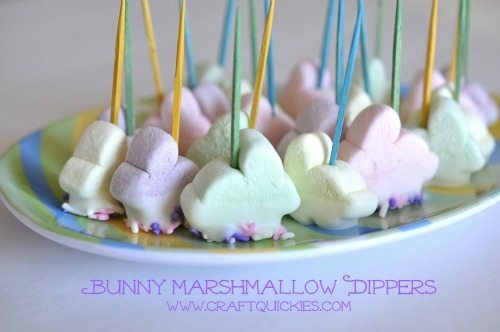 Bunny Marshmallow Dippers: A fun Easter treat that kid can make! 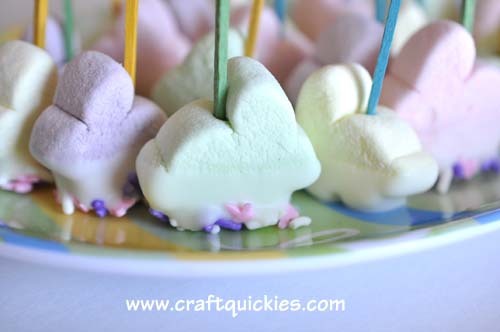 Bunny Marshmallow Dippers are a fun and tasty treat for kids to make and enjoy during the Easter season. Simple enough that even the youngest kiddos can help! 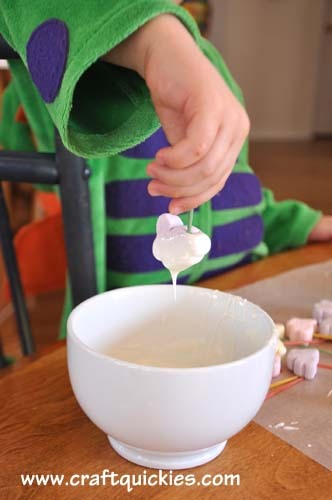 I’ve been meaning to make some cute dipped marshmallows with my son since Halloween. And yet, it has taken until now for me to be organized enough to actually do it. And I have the heart shaped marshmallows and Halloween colored sprinkles to prove it. Whenever my friends say they don’t know how I do all that I do I just laugh. If only they knew the crazed and chaotic way in which I live my life. I’m a scattered, scattered woman. Oy. 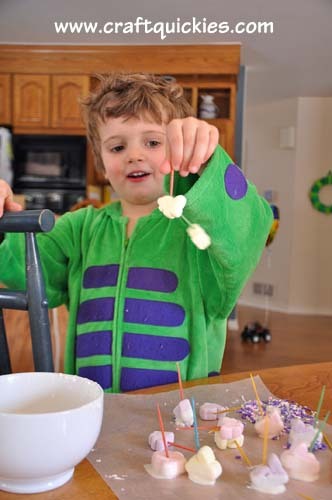 There is nothing earth shattering about dipping a bunny marshmallow, but I’m still excited about this little tutorial because my son and I had so much fun doing these together. 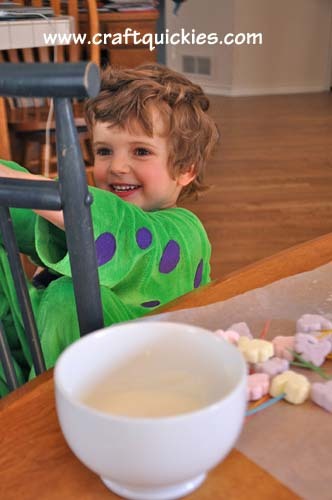 And they were quite tasty and fun to share with his little friend at a playdate the next day. 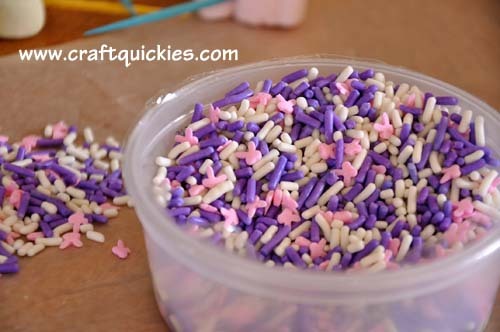 Prep your space by laying out the wax paper and sprinkles. Melt the chocolate or candy coating (we used candy coating) in the microwave in 30 second increments, stirring in between. 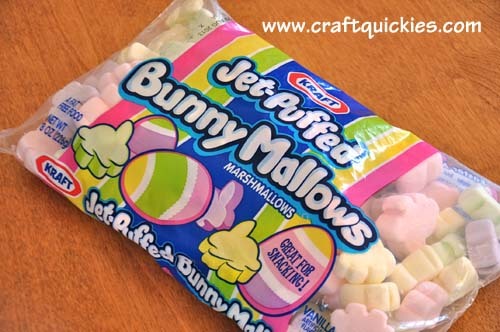 Stick toothpicks in each bunny marshmallow and then you are ready to dip. Do you think this little dragon is excited?! It’s dipping time! Dip away. Dip in the chocolate/candy coating and then sprinkles. 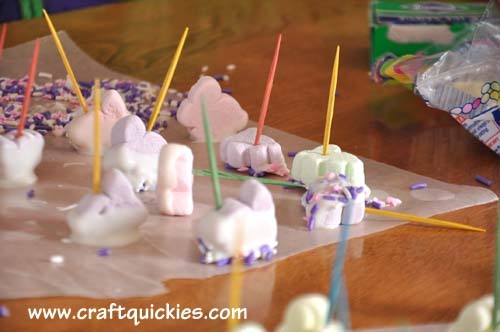 Place them on the wax paper to dry. Can you guess which sheet of wax paper is Mommy’s and which one is Callum’s? Heehee. That is it, folks. There is nothing to this. But it is FUN! So enjoy the process! And be prepared for your little dipping pal(s) to sneak a few little bunnies into their little mouths when you aren’t looking! 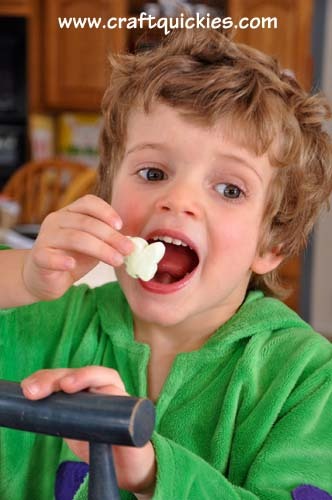 Now line your Bunny Marshmallow Dippers onto a cute little plate (I got this Easter Egg plate at Target) and find a friend to share them with.